Home / Dolls / Doll's Porcelain / Helena, 26″ Porcelain Doll. Helena, a 26″ Vanity Fair porcelain doll with teddy and handbag. This item is beautifully gift-boxed and comes with a certificate of authenticity, a name tag and a stand. 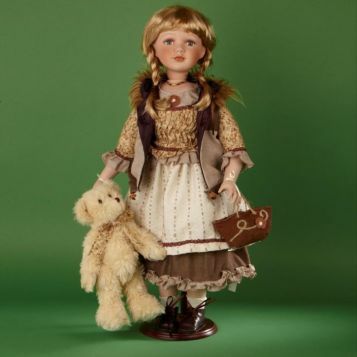 Helena, a 26″ Vanity Fair porcelain doll with teddy and handbag. This item is beautifully gift-boxed and comes with a certificate of authenticity, a name tag and a stand.